Composite images of the suspected killer of Patricia and Robert Wilson. The DeKalb County Sheriff’s Office has released pictures of what the man who killed a rural Sycamore couple might look like. The images are based on DNA evidence gathered at the home where 85-year-old Patricia Wilson and her son, 64-year-old Robert Wilson, were found dead. Investigators determined the two died of blunt force trauma the night of August 14, 2016. The Sheriff’s Office says, despite thousands of man-hours, dozens of search warrants and work with state and national agencies, it has been unable to come up with the name of the killer. The Office says it did recover a fair amount of DNA evidence from the scene. With the help of the Illinois State Crime Lab it created a DNA profile of the suspected killer. It then used the services of a private lab called Parabon to do something called DNA phenotyping. The procedure predicts the physical appearance of a person from their DNA, including ancestry, eye, hair and skin color, freckling and face shape. The Sheriff has now published pictures based on that analysis. They show a light-skinned male of average weight with blonde hair and blue eyes, as he might look at ages 18, 25 and 40. The Sheriff is asking the public’s help in identifying someone who might resemble one of the composites. It’s hoped that will spark new leads in the case. 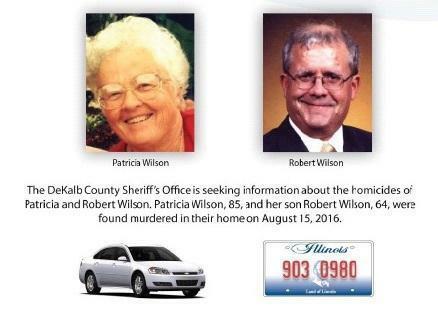 The DeKalb County Sheriff's Office issued an update on the murder investigation of Patricia and Robert Wilson. They were found dead on Aug. 15, 2016, just before 6 p.m. in their home at 16058 Old State Road in rural Sycamore. The DeKalb County Coroner's Office determined the cause of death was due to blunt force trauma. Investigators with DeKalb County and the FBI continue to work on the case. To date, they have received 1,100 leads. Physical evidence has been submitted to the Illinois State Crime Lab. Law enforcement officials continue to analyze forensic results from items that were sent to the state crime lab in the brutal double murder of a rural Sycamore man and his mother. 64-year-old Robert Wilson and his 85-year-old mother Patricia died nine months ago from blunt force trauma after a forced entry into their home. Several agencies are involved with the investigation, including the Sandwich Police Department and Illinois State Police. 64-year-old Robert Wilson and his 85-year-old mother Patricia died five months ago from blunt force trauma after a forced entry into their home. There’s been a new break in the double homicide in rural Sycamore. Police say several hundred leads have been generated into the murders of Patricia and Robert Wilson. Authorities now believe the crime happened between 7:45 p.m. and midnight Aug. 15. The time frame was determined by the last time Patricia was known to have made telephone contact with a family member. There’s also video footage showing the Wilson’s stolen vehicle driving east on Illinois Route 64 in West Chicago.